MUMtastic started from humble beginnings in 1995 around our dining room table in Spring, Texas. 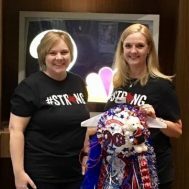 We started slowly, working with the Nimitz High School Drill Team, go Cougars, making homecoming mums and garters as a means for fundraising for the team. Within three years word spread and we were soon working with over 20 schools and organizations. We quickly outgrew the dining room and converted our garage into a full-fledged homecoming factory complete with custom ribbon printing machines and presses and by 2000 we were making well over 12,000 mums each homecoming season. MUMtastic quickly found another market selling directly to floral shops and our product’s popularity spread from Houston all the way to New Mexico and Louisiana. We now have a large workshop and warehouse located north of The Woodlands, Texas and we are very excited to open our storefront , which will service the entire state of Texas and beyond! We pride ourselves on being a family run business that specializes in customer service and creativity! We love bringing school spirit and smiles to families and kids and we love keeping the essence of Texas Homecoming alive! Our motto is Go BIG or Go HOMEcoming! However, going big does not mean breaking the bank! Visit our storefront to pick and choose from beautiful one-of-a-kind custom mums and garters in all sizes and all colors. Match your perfect item with select trinkets, mascots, specialty bears, braids, candy adornments, musical mums and other novelty items. If you have questions or if you would like some guidance, one of our designers will be there to help you put together your perfect statement piece! Or, create your own custom masterpiece via our website and then pick up your completed order from our storefront. Visit us today to create your one of a kind homecoming memories!